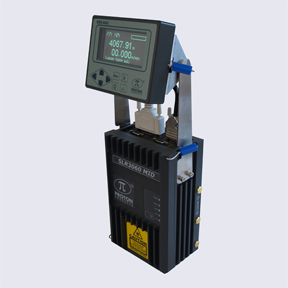 Non-contact, high-speed, solid-state laser speed and length measurement with no slippage, drift or mechanical wear and greatly reduced maintenance compared with contact wheel / roller systems. Bidirectional speed and length measurement; accurately measures speed and length during line stoppage, reversal and creepage. EU MID Class 1 accuracy compliant (0.125%). EU MID-certified (certificate number: UK/0126/0120) for final shipping length measurement for products destined for EU-markets (EU Directives 2014/32/EU 2004/22/EC). EU MID compliant 90-day data logging capability. 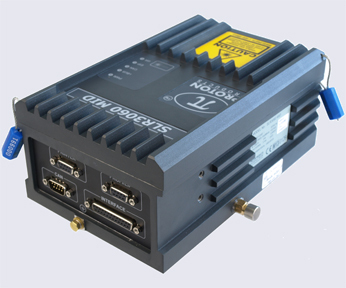 Fitted with PROFIBUS industrial communications bus as standard. 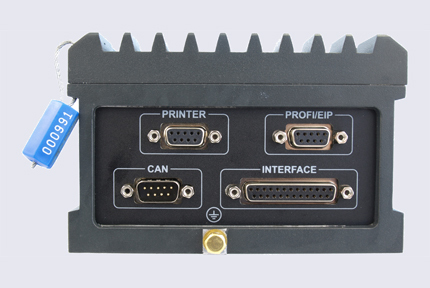 AiG2-MID interface display unit included as standard. Optional external printer available for batch length ticket printing. Proton Products InteliSENS® SLR-MID Series non-contact, bidirectional speed and length gauges provide extremely accurate speed and length measurements in almost any production environment and are MID-certified (certificate number: UK/0126/0120) for final shipping length measurement for products destined for EU-markets (EU Directives 2014/32/EU 2004/22/EC). Automatic direction detection and measurement down to zero speed means that the InteliSENS® SLR gauge length measurement counts both up and down, so final length measurements will still be accurate to 0.05% even with production lines that exhibit stoppage, direction reversal and creepage. Production processes for wire, cable, web products, woven and non-woven materials, paper, plastic film, tapes, building materials, floorings and labelling can all be measured using the laser Doppler method. InteliSENS® SLR-MID Series gauges are money-saving, direct replacements for traditional problematic and high-maintenance contact wheel and roller-type devices and are extremely easy to install and operate. Integration with production line controllers such as PLCs is eased by the availability of a wide variety of industry standard communications interfaces. The InteliSENS® SLR-MID Series is fully-certified to Class 1 accuracy (0.125%) for final shipping length measurement on bidirectional lines for products destined for EU-markets (EU Directives 2014/32/EU 2004/22/EC). 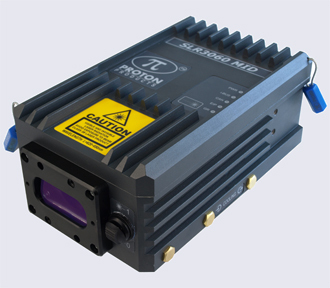 Proton Products InteliSENS® series speed and length gauges illuminate the measured surface with a precisely pitched interference pattern created by the intersection of two laser beams. The alternating bright and dark interference fringes modulate the light scattered by the object with a frequency proportional to the object speed. This scattered light is detected by a photodiode and the electrical signal digitally processed to determine the frequency and hence the speed. Object length is then calculated by integrating the speed measurement over time. The InteliSENS® SLR-MID Series bidirectional speed and length gauges extend this principle by using a high-frequency Bragg cell modulator to illuminate the measured surface with a scanning interference pattern, which generates an oscillating light signal even when the object is stationary. Direction of motion is determined by whether the scattered light frequency is higher or lower than the stationary frequency. Laser safety control inputs Laser An external closed SPST contact enables the laser diode. Shutter An external closed SPST contact opens the laser shutter. Options External printer for batch length ticket printing.